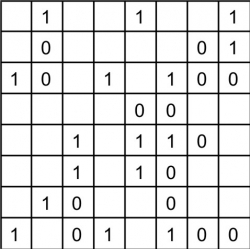 Binary Puzzle is played on a rectangular or square grid. - There are as many digits "1" as digits "0" in every row and every column (or one more for odd sized grids). - No more than two cells in a row can contain the same number. - Each row is unique, and each column is unique.